Pushed back at the last moment after the terrible incident that happened in Manchester, Farm 51’s Get Even finally lands for consoles and PC, giving us a one-of-a-kind experience, with a merge between a horror and suspense first person shooter with a elements from other walking-simulators like Dear Ester. 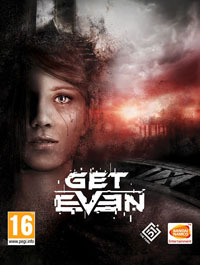 Get Even tells the story of Cole Black, a strange amnesic mercenary, who used to offer his deadly services to the highest bidder. Following his loss of memories, the character will discover a new type of asylum, where he finds himself equipped with a strange helmet that allows him to relive certain of his lost thoughts, and discover why he failed saving a certain young girl whose importance is key to the whole storyline. To progress and discover the truth, we will have to journey through the corridors of this strange psychiatric hospital, quickly realizing that we are not the only patient of the place. While avoiding being killed by one of the many insane people in the ward, you will also have to take the time to search every corner of the hospital, discovering press clippings and audio recordings that allow us to learn a lot more about our situation, and relive strange memories and flashbacks. Far from being tedious, this search for clues is a key element for Get Even, which wants us to live an adventure of a new kind by betting a lot of the experience on its narration. Photos will be the main highlight clues for your adventures, which will allow us to create a vortex and reliving moments of our lost memory. To help us in our quest, although the game opts for an FPS view, it is not a firearm that will be our main ally, but a smartphone. The latter is equipped with different viewing modes including a blue-light to follow traces of body fluid, a thermal camera useful in certain situations and a scanner that helps us find hidden clues. The latter allows us to also analyze DNA traces to learn more about people that may have died in that room, and let you relive certain sequences of our lost memories. Once our abductor judges that we have enough elements in our hands to conduct our investigation, we are automatically tossed back into the present time, in this morbid asylum, where the loop is re-initiated, and we’ll need to look for another photo to learn a little more. It is a pity that this alternation between present and past is technically done by an endless exploration of a linear game levels, and there’s barely any sense of freedom on that front. Cole being a mercenary, will sometimes be in situation to ditch his phone and equip a weapon in order to get out of very complicated situations. However, the game leaves us permanently the choice of either avoiding conflict, or massacre your enemies. In the later choice, you’ll quickly realized that Get Even’s shooting mechanics are not the strongest point of the game, with a very dumb AI. But rest assured, Get Even bet everything on its mood and its narrative approach which succeeds in its own way. Although the graphical engine in the game are not up to what the current generation consoles could offer, the settings are full of details that allow us to plunge into this dark mood. To accompany its lugubrious locations, the developers have done a tremendous job on the sound effects, with a soundtrack that knows how to accentuate the suspense factor when necessary, with good dose of madness like the cries of our assylum cellmates. Get Even was reviewed using an Xbox One downloadable code of the game provided by Bandai Namco. The game is also available on PlayStation 4 and PC in both retail and online store releases. We don’t discuss review scores with publishers or developers prior to the review being published. • Too linear in comparison to other walking simulators. Playing on a minimalist gameplay and offering the worst experience as an FPS, Get Even nevertheless succeeds as a suspense story experience. With a great mood, clean soundtrack, and well narrated story, Get Even can be captivating even if filled with some clichés.